There are a couple of ways this verse has been interpreted. The more common translation is in the vein of Matthew 6:33 – “seek first the kingdom of God and his righteousness and all these things will be added to you”. Make him your focus and eventually the things you desire will materialize. That’s one possibility. I have grown fond of the alternative perspective. 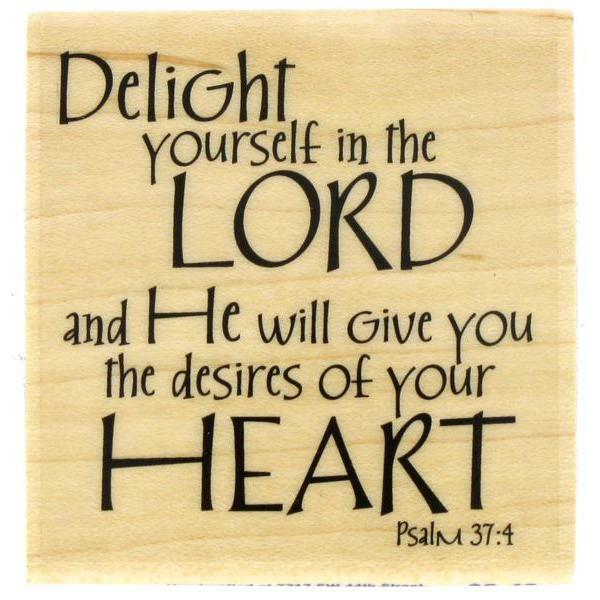 If you delight yourself in the Lord, he will implant desires in you according to his will. This makes sense to me given the functioning of the Holy Spirit’s indwelling and the impact that should bear on our souls. It makes sense that the Holy Spirit, who transmits the will of the Father and bears the presence of the Son, will fuel us with desires that should be course of direction for our lives. Kind of in the vein of Romans 8:26-27 – the Holy Spirit will give us what to pray for. But what if the two interpretations are meant to converge? What if they are actually two sides of the same coin? That things that gnaw at your soul, that won’t go away drives you to the Lord to delight in his presence if only to settle it down. Though it never goes away. And what if by delighting in him, to put him first in everything, the desires are only fueled. I’m beginning to think that a dichotomy between the two interpretations should not exist. If one informs the other it is a signal of future realities. I hope so. I hope that the desires that have gnawed at my soul will materialize in tangible ways. Desires for love, for reversals, for restoration. Desires for transitions, for ministry, for impact, for influence. Desires for my children, their salvation, their lives. Desires for healing and experiencing abundant life. Dear Lord, I know you have looked deep in my soul and know it’s condition, its waiting, its longing and its desires. I pray that you settle my soul and encourage me to delight in you. I pray for the day that desires are fulfilled. Previous Article Is There a Third Option in the Comp/Egal Debate? I’ve always taken it for granted that he made me and he knows or even implanted the things that would give me the most joy. If I remain close to him (hang out with him) I would discover what they are. HD, thanks for stopping by. Yes I agree. I think it all works together according to the Lord’s will. And whatever should not be there, then we’ll eventually get conviction since that too is the role of the Holy Spirit. Hi Lisa, I like your new blog idea! I recall doing a devotional for my Christian high school English class on that verse. My mom suggested the second interpretation you mentioned, Lisa, so I’ve thought of it that way ever since I appreciate the blend that you are contemplating, and Ray has contributed a good nugget as well…. Don’t we all long to be in that place of deep inner contentment and communion with our triune God? While we may still have other legitimate desires who’s fulfillment remains at large, we can find much satisfaction in a deepening relationship with our Lord as we devote ourselves to reading the word and to prayer. We live in the land of the already and not yet….and that is why we look forward with anticipation to the return of Jesus. That is our hope…our anchor….we long and we wait and we suffer…but someday we will have eternity to enjoy the absence of all that pains us now. Come Lord Jesus!